Family Men Don't Wear Name Brands: What's in the Basket? 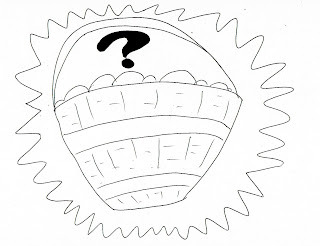 I couldn’t figure out what to put in my 9-year-old son’s Easter basket this year. What I mean is -- the Easter Bunny fills up his basket with goodies, but my wife and I like to put something in there from us. But what? It had to be good, but nothing to spoil the kid. After all, Easter isn’t about gifts. Not huge ones, anyway. I remember the year I learned about greed. I was about my son’s age. My mom said she’d found the ultimate Easter gift for me, one that I’d particularly love. I was intrigued. A gift I specifically would appreciate? My mom talked about it for weeks. I remember thinking it couldn’t have been all that good. It wasn’t. It was a light-up skeleton pen. I think I let out an “Ahhhhh, what the—” when I saw it in my basket on Easter morning, even though I loved to draw and I adored anything to do with monsters, skeletons and ghouls. Maybe my mom’s set-up led me to believe it’d be something like a new wing in the house just for me, with an indoor swimming pool and a skate park. It took me a full minute after seeing the pen before I could fake excitement. I hoped my mom didn’t catch my initial disappointment. She was so eager for me to get that gift. My plan was to never let her find out what I really thought. I reminded her daily how highly I thought of the pen, went out of my way to use it in front of her. After spring break, when I went back to school, one of my friends, Joey, bragged about the motorcycle he got for Easter. He put me through a “here’s how you get good things” boot camp. I learned to ask for fast-food money instead of sitting down with my family for meals. I learned to leave my room so messy that my mom would have no choice but to clean it up for me. I learned that saying thank you was as bad as telling my parents I didn’t need anything else from them. I went along with Joey, but I’d never treat my parents with such disrespect. However, at Joey’s house, I watched how his tactics pleased his parents. Joey got what he wanted, and his mom and dad were thrilled to spoil him. His parents were happy like my mom was happy to give me that skeleton pen. Maybe I could please my parents by telling them to get me a motorcycle. I’d be happy. I found my mom in the kitchen. Joey tagged along to witness my metamorphosis. I just couldn’t do it. I tried. I really tried. But I couldn’t be greedier than I already felt. Joey punched me in the arm, reminding me to stick to the plan. I couldn’t. So Joey did it for me, telling my mom she owed me a motorcycle after insulting me with that lame pen. I was going kill Joey. But first I ran up to my room to hide. After my mom sent Joey home, she came up to talk to me. I hoped my bedcovers, having shielded me from many night monsters in the past, would surely save me from facing a disappointed, hurt mother. Could you believe it? The covers didn’t protect me. My mom talked right through the sheets. I begged for forgiveness, promised I’d never be greedy again. And this year, as I loaded up on stuff for my son’s Easter basket, I thought about that promise. I was acting greedy all over again. I put all the stuff back on the shelf, save a few items. On Easter day, my son’s tiny, almost empty basket looked great. It did. There was plenty in there. Well, it wasn’t about quantity. It was about quality. By quality, I mean it was the thought that counted. Evidently, it was the thought that counted. My son couldn’t have been happier if we got a new wing in the house just for him, with an indoor swimming pool and a skate park. He only wanted us to hide more eggs for him to find. We did egg hunts all day. That night, my son finally confessed. My son assured me that he didn’t need a motorcycle.